I am now offering prints and canvas prints of my artwork! I have been neglecting this blog for a long time. 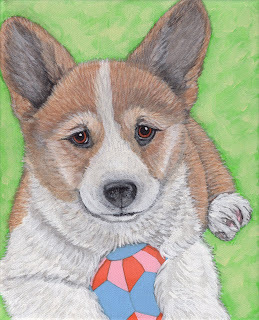 I really feel the need to start painting again and getting my corgi mojo back! For now, I am offering some of my most popular pieces in prints and prints on canvas. These prints come in a variety of sizes and will make perfect gifts for this holiday season. Please browse my print site. I am sure you will find something you like for yourself or a gift for a loved one. I have listed some corgi ACEOs on Ebay! They are original small paintings..not prints! They are 3.5 inches by 2.5 inches - the size of a trading card. I have taken a few of my favorite paintings (and some new ideas)and painted them as small miniatures! These cards are handpainted originals! Art for your pocket! You can trade them with other corgi lovers, frame them, or put them in an album, or someones christmas stocking! The sky's the limit when it comes to small format art! They are painted on heavy watercolor paper, sealed and signed. I then slide the finished piece in a heavy plastic toploader (the baseball card type) for total protection. They can be easily removed by you if you so desire. I finished this diptych~two 8"X10" canvases meant to be hung together to make one unique piece. It is inspired by Kliban, and his black and white tabby cats with their red shoes. I fondly remember them when I was young. They were on everything..towels, bedding, shirts. I always thought they were so cute! It feels good to be back to placing paint to canvas! I was watching (and got hooked on) The Tudors on Showtime. 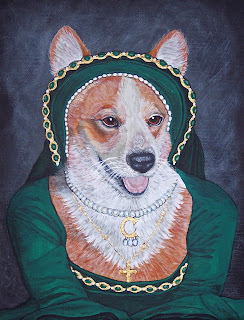 I love the costuming and locales and I was inspired to paint this corgi portrait. Anne was Queen of England from 1533 to 1536 as the second wife of Henry VIII of England and 1st Marquess of Pembroke in her own right. 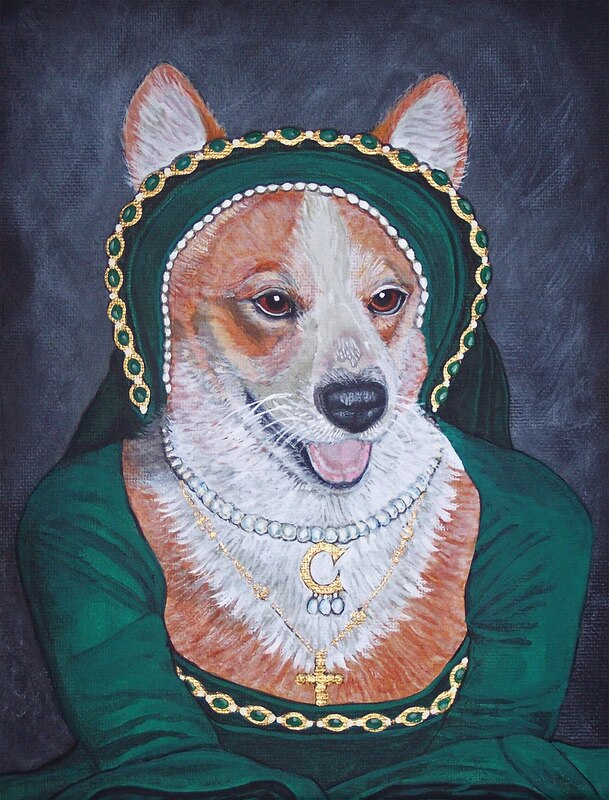 This is my "corgi version" of Anne Boleyn right down to her famous gold and pearl necklace..except of course It's a C for corgi! It was quite fun and I am now offering it on Ebay: "Anne Corleyn Queen of England"
The annual version of “The Watching” by Millie J. Williams, usually released for Christmas Eve, has become a tradition in corgidom, enjoyed each year by thousands of readers. 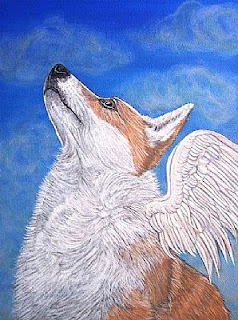 The 2009 story―The Watching: A Corgi Christmas Tale―was published to wide acclaim as a beautiful full color paperback book with dazzling artwork. Now we are happy to offer the equally wonderful 2010 book, The Watching: A Corgi Puppy's Christmas Surprise. This new book will ship beginning December 1, in time for the holidays. Pre-order now to be sure you have your book in time for Christmas. Orders placed before December 1 will receive a bonus bookmark with original Watching artwork. Coming December 1: A special two-week-only eBay auction of the original art created for The Watching: A Corgi Puppy's Christmas Surprise. Also Coming December 1: New holiday ornaments from CorgiAid's CafePress store featuring art from The Watching: A Corgi Puppy's Christmas Surprise.All net proceeds for these books (after printing and shipping) benefit CorgiAid. The books are only $20 each, which includes shipping, so order extras as gifts for all your animal-loving friends, young and old. International orders are $27 each. Purchase your copy and help give assistance to corgis and corgi mixes! I know I haven't painted or posted any new work in quite a while. I need to get back in the game! I miss creating art sooooo much!! 8" X 10" Acrylic on 3/4" canvas. Ready to frame or hang as is! Fun painting to do...and I found it quite the challenge! for this art blog award. Coolness! 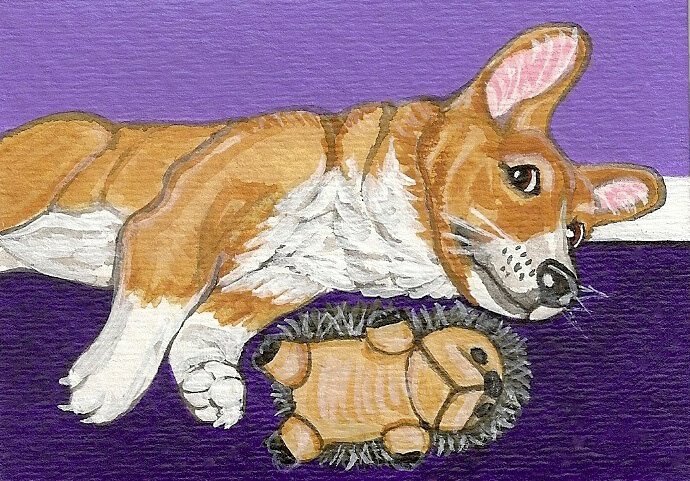 Please check out her blog for corgi cuteness and adorable art! I am supposed to post seven things I love. 1. My family and friends. Thanks for your support in everything I do! 2. My pets. Ever faithful and loving. I can't imagine a home without a warm fluffy friend! 3. Art. I love the beauty of some of the old master's paintings. I love the way some modern art makes me think and see things in a different way. I love whimsical art that makes me smile. 4. Chocolate. Okay, that speaks for itself. Haha. 5. Books. I love to read a good book. I love the smell of a good old book. Weird? This blog has cool art and tips for artists! 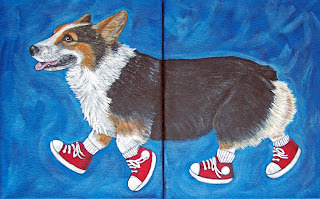 Please visit and browse this blog for original art of the corgi dog, interesting links, and general corgi art madness. I will update this blog as I paint new pieces, and offer new designs. I also sometimes ponder and feel like rambling about random things! 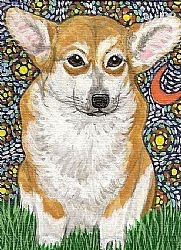 My CafePress store featuring my corgi art! I am a graphic design student and part time artist. 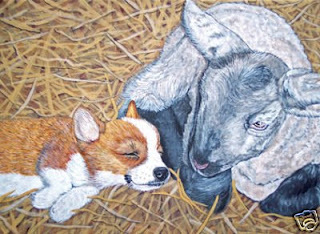 I love to create fun paintings of the whimsy side of animals. Feel free to email me!Just click the envelope..
All artwork and text are protected copyright, Karen Howell 2008-2010. Please do not reproduce without license or written permission.